We pride ourselves on offering excellent customer service. 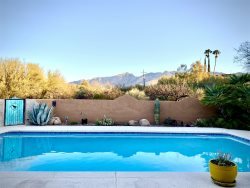 As Tucson natives, we can offer you referrals on the best restaurants, shopping, hiking, activities, etc. Also if you would like to rent bicycles, shcedule horse back rides or jeep tours, etc., we can provide referrals for those services as well. If you would like to have weekly maid service while you are staying, we can connect you with our cleaning crew. This service is provided by them directly to you at our cost. We want to ensure that your stay is enjoyable so that like many of our other guests, you will want to come back and visit year after year.